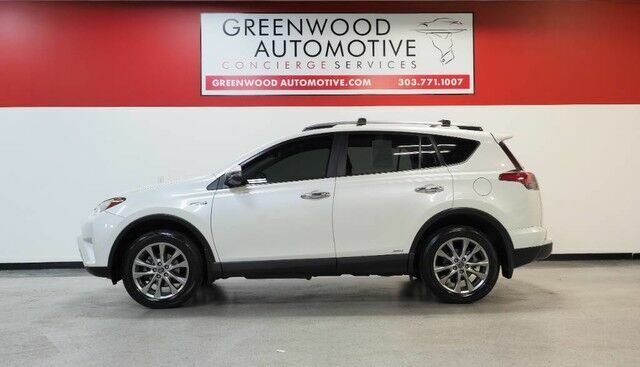 Contact Greenwood Automotive today for information on dozens of vehicles like this 2017 Toyota RAV4 Hybrid Limited. CARFAX shows that this is a one-owner vehicle -- no wonder it's in such great condition. This SUV is a superb example of what a tough, work focused vehicle should be. Exceptional towing, acceleration and torque will help you get the job done. The Toyota RAV4 Hybrid Limited is economically and environmentally smart. Toyota clearly delivers on its promise to provide a fuel-efficient vehicle that has the great qualities you need in a vehicle. Enjoy driving? Well now you will get more thrills behind the wheel thanks to the heightened performance of AWD. Better handling. Better traction. Better driving experience. It's not a misprint. And the odometer isn't broken. This is a very low mileage Toyota RAV4 Hybrid. A rare find these days. This Toyota RAV4 Hybrid is beautiful and the interior is clean with virtually no flaws. WWW.GREENWOODAUTOMOTIVE.COM for all Photos Our Dealer Handling fee of $499 is included in our advertised price. Government fee's and licensing are additional costs. For best service and to check availability or to set an appointment to see and drive call Steve direct at 720-339-1516 or Marc at 303-552-7909 For more information. FINANCING AVAILABLE. TRADES WELCOME. *VEHICLE IS FULLY INSPECTED BY OUR MECHANIC. We are located 4 Blocks West of I-25 on North side Of Arapahoe, Behind US Bank at Syracuse St.